NSR-PG Precision Parallel Gripper is compatible with new e-Series collaborative robots from Universal Robots. New Scale Robotics, a division of New Scale Technologies, today announced that its NSR-PG-10-20-UR Precision Parallel Gripper is compatible with the new e-Series collaborative robots from Universal Robots (UR). “Our precision gripper, the smallest available for UR robots, is the perfect tool to take advantage of the higher precision and sensitivity of UR’s new e-Series robots,” said David Henderson, CEO of New Scale Technologies. The NSR-PG smart gripper is specifically intended for small robots and small parts. It is ideal for use with UR3e, UR5e and UR10e collaborative robots for intricate part handling, measurement, sorting and assembly. The NSR-PG-10-20-UR weighs only 175 grams and handles work pieces up to 100 grams. It connects to the UR tool I/O port with a single cable. It has 20 mm finger stroke and can measure part size with 30 µm precision. The gripper features teachable finger positions and has easily interchangeable fingers. For more features and specifications download the datasheet or visit the gripper main product page. The NSR-PG-10-20 is available through all Universal Robot sales offices and distributors. Find a distributor. It is also available directly from New Scale Robotics at an introductory price of $3,600. Call +1 (585) 924-4450 or email the New Scale sales team. 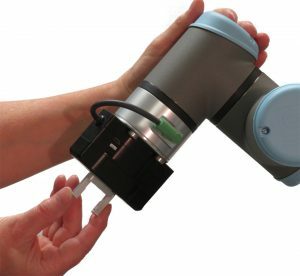 New Scale Robotics (www.newscalerobotics.com) designs and manufactures precision smart grippers and end-of-arm tooling for the smallest collaborative robots. We have more than 15 years of experience and numerous patents in micro motor and motion control system development. New Scale products feature unmatched miniaturization, micrometer-scale resolution, and fully-integrated microelectronics with intelligent firmware. Our customers benefit from high performance, superior ease of use, and fast system integration. New Scale Robotics is a division of New Scale Technologies, Inc. near Rochester, NY.